There is nothing more important than clean air in your home. A large number of people fall prey to various diseases and allergies due to unclean air. We realize that keeping your air ducts clean can combat the issue of breathing problems, and the related diseases that may ensue. That is why we offer air filters for your ducts. These filters keep the harmful pollutants and dirt out of your home where it belongs. Damp heating and air conditioning ducts offer a perfect breeding ground for bacteria, fungi and dust mites. Since these air ducts are used to heat and cool your house, various forms of allergens spread even more rapidly. Poor ventilation and dirty filters restrict fresh air and contribute to an unhealthy environment in your home. Fungal growth in ducts can be quite problematic. As we know that there is a lot of moisture and dirt within the ducts, it grows significantly in those areas as a result. We recommend that you must get your air ducts cleaned at least once a year. Considering the severe consequences and associated health risks that may result in an unclean and unprotected home, it is in your best interest to make sure your home is free from all bacteria and health risks. 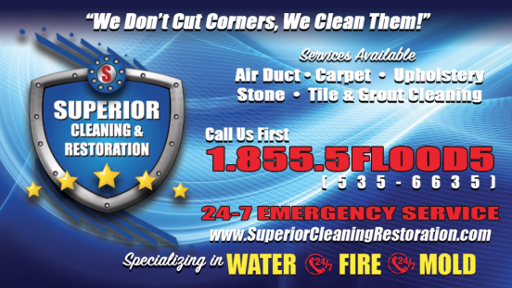 At Superior Cleaning and Restoration Inc. we specialize and excel in air duct cleaning services in Solana Beach. We are the only company in Southern California with a truck mounted duct cleaning system. This is the #1 recommended system by HVAC duct manufacturers. It not only cleans better than any other system it’s also safer for the ducts and won't tear the lining which decreases air flow and efficiency. Air duct cleaning may not be able to treat your respiratory issues, but it is certainly the most efficient way of preventing such issues. Solana Beach residents should have our experts clean their air ducts once a year. It’s not only what’s best for you but also what is best for your HVAC device. Two out of three indoor air quality issues are due poor HVAC/Air Duct System.